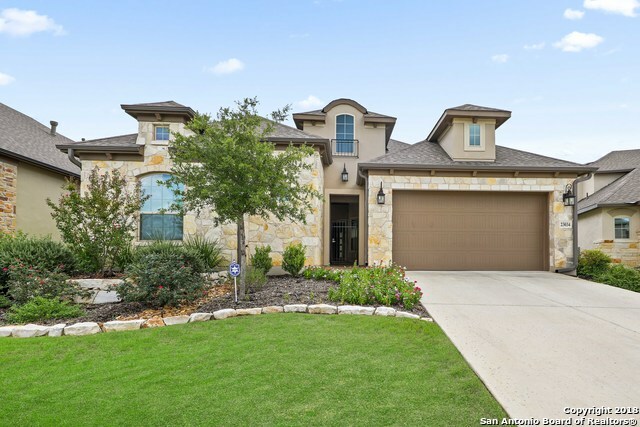 All AMOROSA homes currently listed for sale in San Antonio as of 04/22/2019 are shown below. You can change the search criteria at any time by pressing the 'Change Search' button below. "Beautiful Luxury Garden Home with Separate 1 bdrm/1bath Casita. Main Home has 3 Bdrm/3Bath. Open Floor Plan. Gourmet Kitchen with Top of the Line Stainless Steel Appliances. Large Granite Island with Breakfast Bar. Beautiful Custom Light Fixture in Dining Room. Master Bath has Large Spa Shower. Large Walk-in Closet. Elegant Tile Floor Throughout. Hunter Douglas Blinds Throughout. Enjoy and Cozy up in Large Covered Patio w/Fireplace. Yard Maintenance included in HOA fees." "THIS GATED SITTERLE LUXURY GARDEN HOME COMMUNITY FEATURES WALKING TRAILS, ACCESS TO CIBOLO CANYONS AMENITY CENTER, FULL LAWN MAINTENANCE AND MONITORED SECURITY. THIS HOME SITS ON A BEAUTIFULLY LANDSCAPED CORNER LOT AND HAS AN OPEN FLOOR PLAN WITH HIGH CEILINGS AND INDOOR FIREPLACE. FULL IRRIGATION." "Open floor plan, high ceilings with Formal indoor dining and outdoor uncovered patio dining, . Full irrigation, full lawn maintenance. Monitored security, walking trails, access to Cibolo Canyons Amenity Center." "Gorgeous previous model home with amazing upgrades and features. Open floorplan, lock and leave home, floating ceiling, hardwood floors, modern painting, granite countertops and 5 burner gas range. Upgraded metal roof. Spacious master bedroom with his and her closets and spa like ensuite. Your lawn will be maintained by the HOA! Conveniently located near US 281, TPC Pkwy and Evans Road. Views off the top balcony of the JW Marriott Resort & within walking distance to the PGA golf courses." "OPEN FLOOR PLAN WITH HIGH CEILINGS. FULL IRRIGATION AND LAWN MAINTENANCE. MONITORED SECURITY. WALKING TRAILS, ACCESS TO CIBOLO CANYON AMENITY CENTER. GATED COMMUNITY." "Gorgeous 3 bd, 2 bath plus study w/an open floor plan, high-end finishes, 8 ft. doors, oversized baseboards & fabulous upgrades in a gated community. Spacious w/beautiful wood floors, floating ceilings with ambient lighting, custom cabinetry w/quartz & granite counters & a 5-burner gas cooktop. Can be purchased FULLY FURNISHED. The entire lawn is maintained by the HOA. Close to TPC San Antonio, short drive to the airport, supermarket & pharmacy. Rec. Cntr w/Lazy River & Clubhouse + new pool by t"